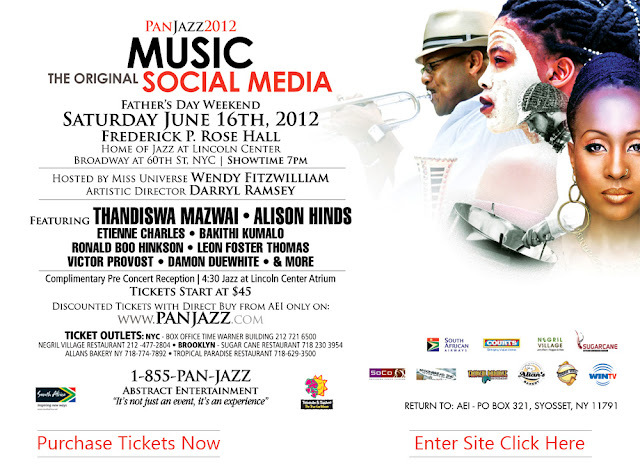 It's that time of year where I pack up my Georgy bungle and head to NYC for PanJazz. I'm looking forward to Allison Hinds' contribution this year! Start the experience off right by attending the Complimentary World Pre-Concert Reception. The Pre-Concert Reception will feature tastings from various indigenous restaurants in and around New York City featuring Caribbean and South African delights. Reception Kicks off at 4:30pm in the Jazz at Lincoln Center Atrium on the 5th Floor. Following in the footsteps of artists like Miriam Makeba, Dorothy Masuka and Brenda Fassie, singer and songwriter Thandiswa Mazwai is one of the most popular female musicians in South Africa today. Previously the lead vocalist of award-winning group Bongo Maffin, with whom she played a part in the foundation of the Kwaito music scene, Mazwai has enjoyed a great deal of success since she launched her solo career. She received a Metro FM award for Best Female Vocalist in 2004 after the release of her debut solo album, Zabalaza, an achievement that was followed up in 2005 at the South African Music Awards, where she won the Best Female Artist and Best African Adult Contemporary awards. 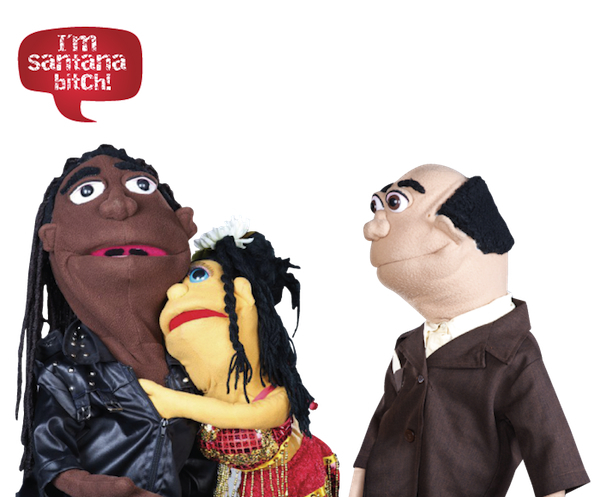 We’ve been huge fans and supporters of Roger Alexis’ “Santana” shorts so as soon as we found out the badbwoy Trini puppet and viral video sensation was getting his own full-on feature film, we knew we wanted to be involved in some way. We’re excited to announce that Flatbush Film Festival organizers CariBBeing will be bringing I’m Santana to New York for its U.S. debut this month. LargeUp is the official media sponsor for the screenings, which will be held at the Rerun Theater in Dumbo, Brooklyn, on April 17 (9 p.m.) and 18 (6 and 7:45 p.m.); Pulse 48 (formerly CPAC) in East Flatbush, Brooklyn, on April 19 (6:30 p.m.) and 20 (7 and 8:45 p.m.); and the Maysles Cinema in Harlem, on Sunday April 22 (3:30 and 5 p.m.). Get your tickets here and stay tuned for more details here on LargeUp, and on CariBBeing’s Facebook. In the meantime, keep yourself occupied with the trailer and our interview with creator Roger Alexis! 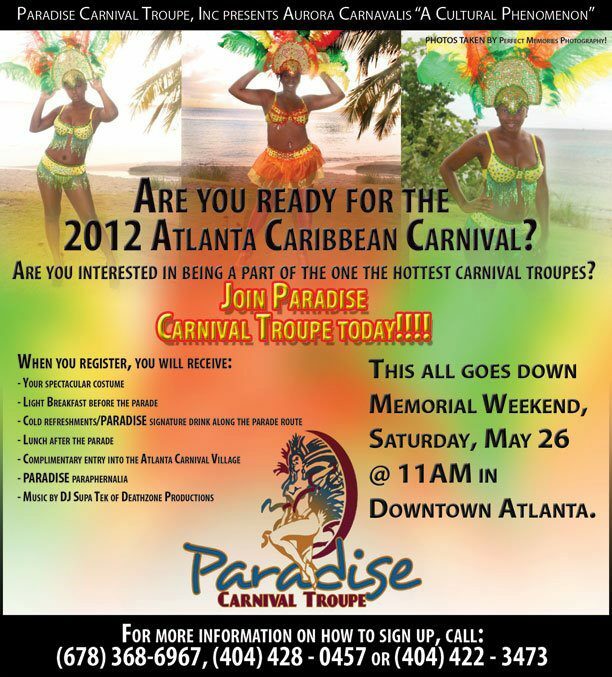 SATURDAY, APRIL 7, 2012 Paradise Troupe & Mocko Jumbies R Us are... giving you choices for Atlanta Carnival 2012. They will be at Thomas Bakery (4051 Covington Hwy - Decatur, GA 30032) on Saturday, April 7th from 2PM - 4PM. 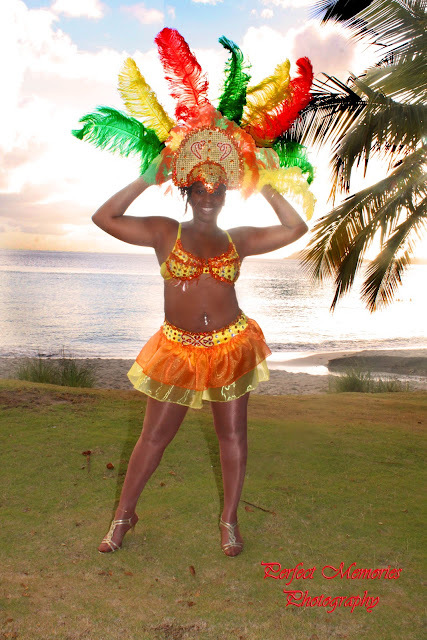 Come see our costumes for Atlanta Carnival 2012 and secure your spot!!! An $80 deposit will be required to join the troupe & a $35 deposit will be required to join the mocko jumbies! Paradise Troupe & Mocko Jumbies R Us on deh road with Supa Tek of Deathzone Sounds!! It's going to be mas again!!!!!! This style is available in 2 piece or 1 piece.